Florida Crocodile Spotted Lounging...On A Pool Noodle? Victor Perez snapped the photo of the crocodile lounging on a yellow pool noodle on August 6. The unusual sight caught the attention of the National Weather Service in Key West, which shared the photo on Twitter. The croc was spotted in Key Largo in the area of mile marker 105.5. One Florida crocodile used its noodle while lounging in a Key Largo canal on August 6. 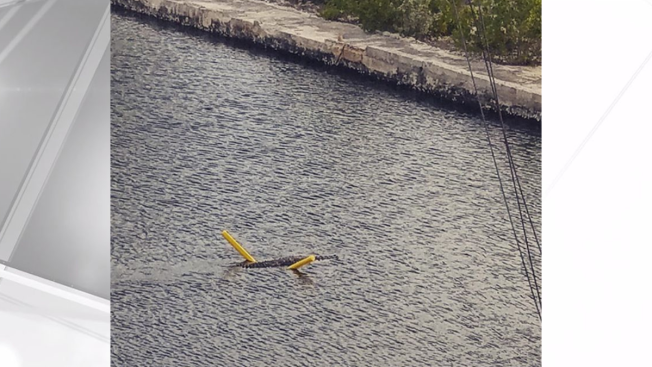 Instead of thrashing about the water to stay afloat, the reptile found a yellow pool noodle to relax on. Victor Perez caught the only-in-Florida moment on camera, posting the photo on his Instagram page. “Crock on a float,” he wrote in the caption. The National Weather Service in Key West commended the croc’s adherence to safety. Perez said he spotted the crocodile in mile marker 105.5. We probably won’t see another sight like this for a while…crocodile.